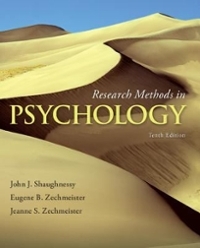 Research Methods in Psychology 10 Edition Psychologists use a variety of research methods and tools to learn about behavior and mental processes. The goal of this book is to introduce students to the “multimethod approach” to research in psychology, including observational, survey, and experimental methods. Students learn the strengths and weaknesses of each method, as well as ethical dilemmas when using them, so that they can become competent practitioners and thoughtful consumers of psychological research. Our approach is to engage students in the research process by describing contemporary research in psychology. Students learn about recent topics such as online dating and Facebook, cross-cultural observations of helping behavior, PTSD in orphaned chimpanzees, Medicaid and Medicare health outcomes, decision-making during Hurricane Katrina, clinical research and DSM-5, and much more. Each chapter's “stretching exercises,” “stat tips,” review questions, and challenge questions develop students' critical thinking about the psychological research that appears in scientific journals and in popular media. Together with the companion Online Learning Center for students, the 10th edition of Research Methods in Psychology provides a clearly written, compelling introduction to research methods in psychology.